PricewaterhouseCoopers and CB Insights’ Q2 2018 MoneyTree report highlights the latest trends in venture capital funding globally. Dollars were up 2% in Q2’18 as a record $23B was invested across 1,416 deals. 45 mega-rounds of $100M or more contributed to the strong quarterly funding total. Total quarterly funding to Asia-based companies increased 10% in Q2’18 as $21.2B was invested across 1,300 deals. 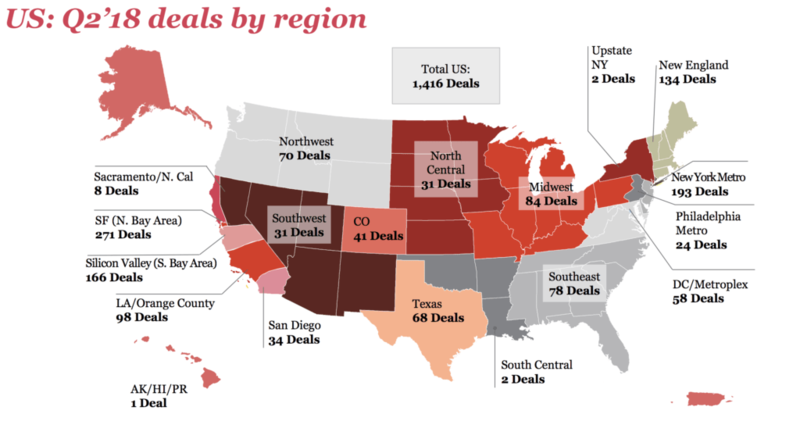 Silicon Valley deal activity declined to 166 deals in Q2’18, down from 170 in Q1. Total funding increased slightly to $3.9B. While San Francisco deals increased to 271, up from 260 in Q1.